Traditionally autumn is the harvest season. The grapes are harvested - the first step in the production of wine. In the last Dutch Carillon News we could announce various carillon events, now you will find, as it were, the fruits: many of them were successful, as you will see in the reports. Yet everything has to turn into wine. The juice has to ferment, ripe, put into bottles, corks have to be drawn and the wine has to be enjoyed. That is indeed the goal: enjoy what has been prepared, and use it to a good effect. By now you will have understood the meaning of my small sermon. The reports are there to give ideas, and inspire. Isn’t that beautiful? Inspiration, spirits, the genie out of the bottle! Lechaim! Tuesday 8 November Wilbert Berendsen, student of the HKU Netherlands Carillon School, will play the second part of his exam, in the form of a concert played on the carillon of the Utrecht Dom Tower. The exact time will be announced via Facebook and Twitter. In advance we wish Wilbert good luck! 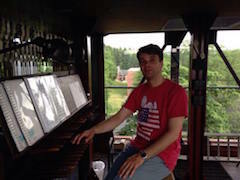 Vincent Hensen, student of the HKU Netherlands Carillon School, has been appointed carillonneur of Veendam and Winschoten. He succeeds the now retired Adolf Rots. In Veendam Vincent he already took up his new position, Winschoten will follow on 1 January 2017. Many carillonneurs have fond memories of the Amersfoort Monument of the Belgians. Since the years 1950 this small building houses the only outdoor practice carillon of the Netherlands. The instrument has been played throughout the years by generations of carillonneurs. The commemoration of World War I has led to a thorough restoration of the monument, that keeps the memory of the many Belgian refugees who in 1914-1918 were sheltered in the Netherlands, Amersfoort being one of the major centers. During the restoration the carillon had to be taken out. On 26 October the monument and its carillon will be re-inaugurated with a ceremony in presence of the Belgian ambassador and the major of Amersfoort. The music during the ceremony will be played by Konrad Koselleck and members of his bigband, the Corps of Reservists and carillonneur Christiaan Winter. All are invited for the ceremony, which is on Wednesday 26 October, 15:00-16:00 h., at the Monument of the Belgians, Belgenlaan, Amersfoort. The North American Carillon School in cooperation with the Guild of Carillonneurs in North America, the Springfield (IL) Park District, The Rees Carillon Society, and other private and business sponsors will be hosting the "Thomas Rees International Carillon Competition" in June 2017. The competition will be held on June 2 and 3, 2017, preceding and in conjunction with the International Carillon Festival 2017. The competition will be modeled after the renowned Queen Fabiola Competition, held every 5 years, in Mechelen, Belgium. In contrast to the Queen Fabiola Competition, due to the great travel distances within North America, the preselection of the 5 finalists will take place via recording submission in early 2017. For more detailed information, the competition rules and registration forms, please download the forms on the website of the North American Carillon School. A musical sketch about the life of the Roman soldier who gave his cloak to a beggar at the city gates of Amiens. In 371 Martin was acclaimed bishop of Tours. His sober way of living is one of the inspirations for this composition, like the use of fifths with there open, pure character. Martin was born around 316 and died in 397. On november 11th, now known as Saint Martin’s Day, he was buried. Lennart Siebers (1988, Nijmegen) is a Dutch pianist, composer, producer and multi-instrumentalist. He grew up in an environment with music and fine arts and thus at a young age he became fascinated by the effect those two had on him and on one another. Since then image has always been a great inspiration in his compositions and improvisations. In 2012 he graduated from the ArtEZ conservatory in Arnhem, the Netherlands, where he studied jazz & pop piano. His teachers were Jeroen van Vliet, Michiel Braam and Robert Vermeulen. He also studied composition with Dolf de Kinkelder and classical piano with Aljosja Buijs. Besides his work as a live-musician (solo and other projects) he writes music on a regular basis for choreographer Jasper van Luijk (IT’s Choreography Award 2012) since 2010 and scored the music for different theater pieces in collaboration with Toneelgroep Oostpool and Introdans. Recently the carillon of the Breda Grote Kerk has been given a new playing cabine and an extension of some small bells. To celebrate this, Paul Maassen, in cooperation with ‘Torenspektakel’, the Friends of the Chassétheater, De Nieuwe Veste and the Netherlands Carillon Centre, organized an international improvisation contest. Next to the Dutch competitors – Jan-Geert Heuvelman, Rien Donkersloot, Bob van der Linde, Wim Ruessink and Vincent Hensen – there was the Belgian Jakob de Vreese and the American Rachel Perfecto. During two rounds the candidates could choose themes by the members of the jury: Daan Manneke, Carl van Eyndhoven and Gijsbert Kok. The fourth theme was taken from the oeuvre of the late Jacques Maassen, the former carillonneur of Breda. The first prize was awarded to Rien Donkersloot (alumnus of the Netherlands Carillon School of HKU, carillonneur of Haarlem, Goes and Ridderkerk) , the second prize to Bob van der Linde (student of the Netherlands Carillon School of HKU). The fine weather, te excellent organization, the high level of the candidates and, last but not least, the good atmosphere during and after the contest, made for a successful event. Photo: the jury at work in the garden of the Breda Lutheran Church. From left to right: Carl van Eyndhoven, Daan Manneke and Gijsbert Kok. The European carillon organization Eurocarillon held its thirteen festival from August 18th to 20th in Amsterdam and Dordrecht. It was organized by the president of Eurocarillon Boudewijn Zwart. Frank Deleu (Bruges, Belgium), Raimundas Eimontas (Kaunas, Lithuania), Adrian Gebruers (Cobh, Ireland), Jean-Bernard Lemoine (Lyon, France), Trevor Workman (Birmingham, England), and myself from Berlin, Germany as well as the Eurocarillon secretary Geoffrey Armitage and his wife Janet took part. The Polish and Japanese carillonneurs Kaisia Piastowska and Toru Takao also performed. The Italian and Czech bellfounders Emanuele Allanconi and Peter Manousek brought their travelling carillons made of 25 and 57 bells respectively. For the concerts see Dutch Carillon News no. 27. The evening concert in Dordrecht’s Grote Kerk on August 18 featured piano, the Lithuanian soprano Eglé Gerasimovaité and the singing saw played by David van Amstel accompanied by Deleu, Gebruers, Piastowska, Workman and Zwart playing his travelling carillon. On the second day the carillonneurs played the carillons in the Oudekerk, Westerkerk and Munttoren in Amsterdam (The carillon of the Zuiderkerk was left out due to construction work) and Boudewijn Zwart and Gideon Bodden premiered the suite The Order of Bellatrizia by Jan-Bas Bollen on the carillon of the Oudekerk. The players offered the usual mixed bag of popular tunes, classical works and carillon music and were rewarded with the pleasure of playing the beautiful Hemony instruments and the breathtaking views of the city from the dizzying heights. Besides the concerts on the third day of the festival on the carillons of Dordrecht’s Grote Kerk and town hall, Zwart performed on the Italian and Czech travelling carillons accompanied by a group of five brass players called the Nederlands Torenmuziek Ensemble and the festival closed with all the carillonneurs playing the Czech travelling carillon. The participants enjoyed a wonderful closing banquet in the Klokhus and watched and listened to English change ringing on the peal of bells above the building. They departed taking with them memories of great music, beautiful carillons, impressive towers and the joy of meeting again after the seven long years since the last Eurocarillon festival. Photo: Frank Deleu, Boudewijn Zwart, Emanuele Allanconi, Jeffrey Bossin and Raimundas Eimontas in front of Allanconi’s travelling carillon. The next Dutch Carillon News will appear at the beginning of December. Please submit copy (maximum 250 words) for this issue before December 1st to redactie@beiaardcentrum.com.